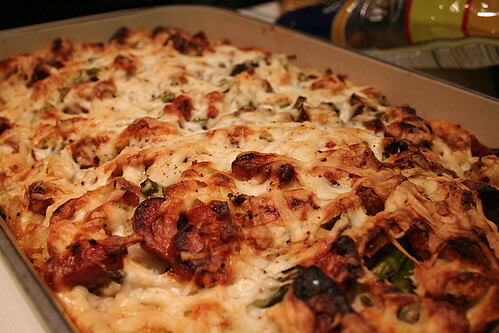 I spied a savory bread pudding recipe awhile back, unhealthy and have been dying to make it ever since. It just seemed like too much for two, for sale so I’ve been waiting until I had company over. Also, I’d never made it before and you never try a recipe out when company is over for dinner. What a quandary. Last night I had a small dinner party for my family to celebrate Christmas since Tom and I will be in Michigan on the actual day. Family is the exception to the never make a new recipe rule. My family loved it, Tom took it to work for lunch, and I’m sorry there’s no more left. I love this recipe. The bread is soft and creamy, the veggies add a nice medium texture, and the firmness of the sausage keeps the dish from being too mushy or soggy. Also, who can resist a bunch of browned and melted cheese? No one. Using a serrated knife, cut the bread into 3/4-inch cubes. Repeat with the remaining bread and put all of the cubes in a VERY large bowl or two bowls if you don’t have one that’s big enough. In medium bowl, whish together the milk, broth, eggs, salt, pepper, and oregano until combined. Pour the mixture over the bread. Snap off the tough ends of the asparagus and cut the spears into 1-inch pieces. Add them to the bread along with the mushrooms and shallots. Slice the sausage into thin rounds, then cut the rounds into half moons and add them to the bread. Fold everything together well to combine the ingredients. Spoon them into the prepared pan and pat down the top to compact the ingredients. Sprinkle the cheese evenly ever the top. Bake the pudding for 45 minutes, or until the top is browned and crisp and there is no liquid in the center. Let sit for 10 minutes before cutting into portions. Note: I made this in the morning before work and popped it in the oven when I got home. This worked very well, and I suspect you could even prepare it the night before if you’re having company over and you’d like to save some time. I’m going to try this for our office “treats” day this week. I’m sure I saw a comment from Mel saying you now substitute apples for mushrooms and add fennel ….but now I can’t find that comment! Can you point me in the right direction, or at least confirm I’m not dreaming?